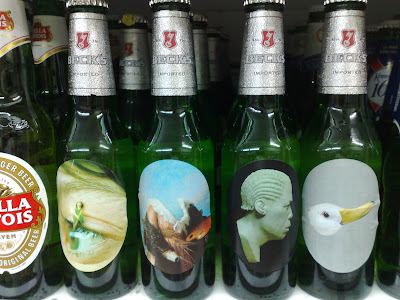 These Becks bottles are part of the Becks Canvas project where Becks have given 4 Royal College of Art students a platform to share their art. 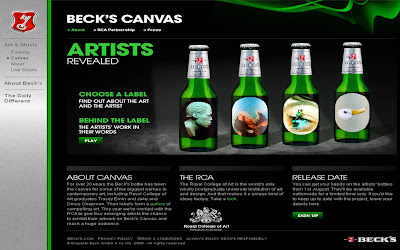 Tom Price, Charlotte Bracegirdle, Riita Ikonen and Simon Cunningham have all been given the opportunity to show case their images on Becks bottles through the Becks Canvas project. 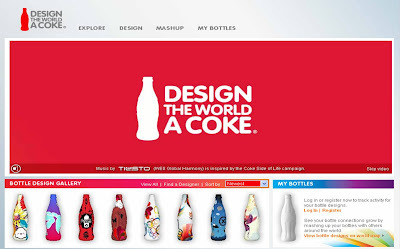 Limited edition packaging is an interesting brand differentiation at point of sale and I think the Coke Zero Zero 7 tie up, the Coke Olympic designs and the Becks Canvas project are great ways of creating talking points and enhancing products. If this is a trend I wonder who will be next? Limited edition Evian, £30 pot noodles and £85 Burger King burgers!